Tonight’s pork marinade is German Mustard Sauce with some cumin seeds, just to give it a spicy kick to the pork. Added to that were strips of ginger and garlic. But I think I should have added in 2 tablespoon of garlic, rather than just one only. The mustard that flew all the way from Germany. Ok, it didn’t fly on it’s on but rather carried in the bags of my German colleagues early last month. Tomorrow is a fish day. Not sure what kind of fish I will be cooking but it will be some bounty from the sea. I saw some edible flowers in a pack at Cold Storage, Green Heights Mall, Kuching, Sarawak. So bought a pack and made a salad. This is what’s inside that salad. Certainly tasted better than what I had expected although hopefully the flowers are ok to be eaten. These flowers are grown in Genting and surprisingly, came out tasting really well. The only flowers that I recognized were pansies and chrysanthemums. 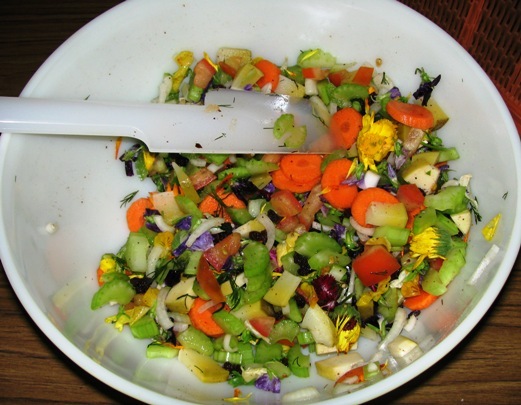 The problem with flowers in salad is that they should be added in last as the petals started peeling off after mixing. Found that out the hard way. I find that in order to eat raw salad, I had to chop up the veggies into small pieces so that it goes down better. The other thing that I find that I had to do was not include lettuce so much. Can’t stand the taste of it too much. And finally, the salad needs to have a minimum of 4 different ingredients so that I get an interesting flavour. This was an experiment with feta cheese. 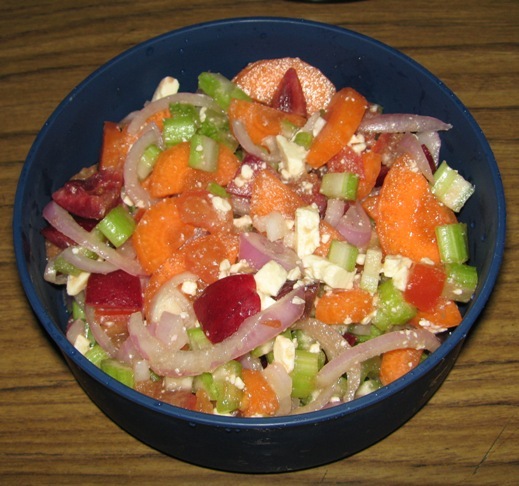 In it, I had fresh cherries, shallots (small onions), 1 glove of garlic (minced), celery, carrot and onion. The size of the container was 200 ml and surprisingly, that amount is enough to last me until lunch time. Not bad for a person who used to have huge carb breakfast meals. More pics another day. Cheerio!